Fans of the sour candy are overjoyed already. Sour Patch Kids have been around for a long time in candy form but, more recently, they've also been reimagined as candy corn and even ice cream. Now, the tart and tangy gummies are getting a new makeover, but this time they'll be hitting the breakfast table. Don't miss the latest trending food stories and TODAY's favorite recipes! Sign up for our newsletter. 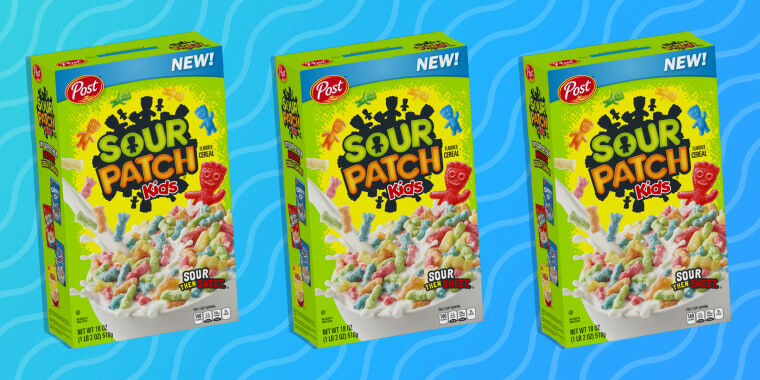 Rumors of a Sour Patch Kids-flavored cereal have been making the rounds on social media for a few weeks but on Wednesday, a representative from Post officially confirmed the new product's release to TODAY Food. Post's Sour Patch Kids cereal will be available starting Dec. 26 exclusively at Walmart stores across the country. One box will set you back $3.98. In an interesting departure from trying not to start mornings off on a sour note, Post's newest cereal promises to contain a cereal that is “sour, then sweet," and if it’s anything like the iconic candy, we can bank on puckering up to fruity flavors of lemon, lime, orange, red berries and, of course, blue raspberries. The cereal itself will also be shaped like the child-like figures of the original candy. We can't really imagine what that sour powder tastes like when mixed with milk, though. I'm not feeling this idea of Sour Patch Kids Cereal as I was taught through life that sour milk is not a good idea. I can’t finish a bag of Sour Patch kids. How imma finish a bowl of Sour Patch cereal? While breakfast cereals aren't as popular as they used to be, companies are continuing to release unusual boxes to grab consumers' attention in crowded supermarkets. In 2017, Post relaunched its Oreo O's cereal after a 10 year hiatus. And after adding artificial coloring back to its popular Trix cereal, General Mills also brought back the classic fruit shapes from the 1990s. There's even a "Golden Girls" cereal (which is inexplicably bright blue) for people who just can't enough of their favorite sitcom icons. But should cereal actually be sour? Only time will tell if this mouth-puckering trend really catches on. If you don't live close to a Walmart, fret not. A store representative told TODAY that the Sour Patch Kids cereal will be available at other retailers across the country starting in June of 2019.